Linkin Park have released a lyric video for their new track Good Goodbye. The song will feature on the band’s upcoming album One More Light which will launch on May 19 and follows the tracks Heavy and Battle Symphony. 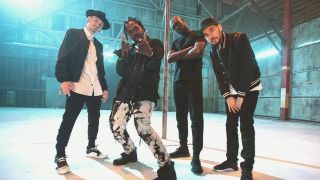 Good Goodbye sees the band collaborate with Pusha T and Stormzy – with Linkin Park’s Mike Shinoda revealing earlier this week how the chance to work with the UK grime artist came about. He told the BBC: “We reached out when his album was still under wraps. His manager came back, he said Stormzy loved the idea and just asked us to be patient. Yesterday, it was revealed that Linkin Park frontman Chester Bennington was in the studio with Lamb Of God guitarist Mark Morton working on a new project. Linkin Park will head out on tour from next month in support of One More Light.